Here's one that will cause some confusion: there are now two GroupMe apps in the Marketplace. The first one is v3.0 which reported on back during Mobile World Congress. That's the version 3.0 overhaul that we really like as it includes a Live Tile, notifications and a complete UI redesign. But it also had a few bugs and quirks as many of you had pointed out. Luckily, version 3.1 is now out and it reportedly fixes a lot of those issues. Problem is, you won't see the update notification for the Marketplace. The reason? 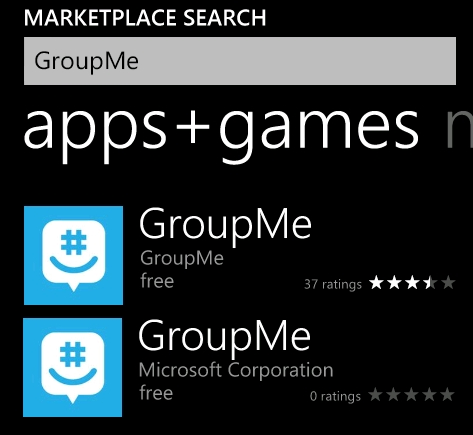 There is a second, newer GroupMe app in the Marketplace but it's listed under Microsoft Corporation. For those keeping track, Skype bought GroupMe in 2011. Microsoft bought Skype, so by the transitive property, Microsoft owns GroupMe. And we guess they are now claiming it as their own, re-releasing the official app under their account (in fairness, there's no other way for them to get around this issue, so two it is). We imagine the first GroupMe (under that company's name and left at v3.0) will eventually be pulled, but for now we recommend you uninstall that app and go get the new one with the bug fixes and keep up to date. Grab the new Microsoft GroupMe here in the Marketplace for free. Thanks, Adrian, for the heads up!